The Versa Spa has been voted the most popular indoor spray booth in the industry for over 6 years running. Features an open design and creates a flawless bronze glow. With an option to add a cosmetic bronzer for immediate color and prep or post application for better results. This is no ordinary sunless booth. VersaSpa Pro combines innovation after innovation to transform your skin in just minutes. Bronze, Hydrate and Smooth fine lines in one session. Customize your tanning application by selecting one, or combing all three full-body treatments - a pre sunless pH balancing treatment, one of two sunless bronzing treatments, and a post-sunless super hydrating treatment. Enjoy the process as much as the results and relax, with a wide-open interior design. People come to Tommy’s Tanning for many reasons: to look and feel great about themselves, for the color before the vacation to prevent burning while outside in the sun or to relax in the comfort of our high-end salons. 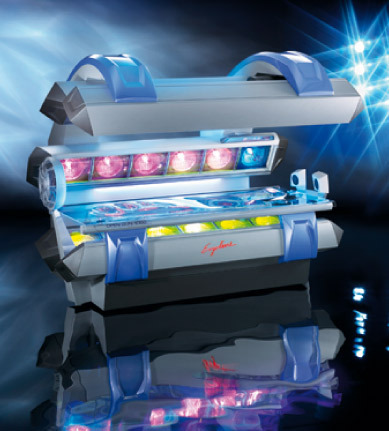 Tommy’s Tanning features the best selection of indoor sun tanning equipment from 10-15 minute laydown equipment to 9-12 minute stand-ups. Several of our beds include several amenities from facial to shoulder tanners, cooling fans, MP3/IPod connection and even aromatherapy!